Dave K5MQ has been running WSPR for 4 days at 100 mW output on 40 meters. To show the behavior of the propagation from day to day, I made a overview for four days. This analysis uses the same data as Blog entry of yesterday, but also shows the relative signal strength of the received signal. Horizontally you find the time in UTC in blocks of 1 hour. Each rectangular black block indicates an hour, in which one or more spots occurred and the calculated lowest possible power of that spot(s). Vertically you find the lowest possible power, which is a good indication of the signal strength. The lowest possible power is calculated from the power of the sending station and the SNR of the receiving station. The higher the SNR, the better the propagation and the lower the lowest possible power. can be easily recognized and can be easily explained. hi. Propagation diagram. K5MQ WSPR on 40 m with 100 mW. Dave 's signal was received by WB5WPA over a distance of 500 km at 13 utc on the 24th with a calculated lowest possible power of 1 milliwatt. From 13 utc on the signal becomes weaker. At 18 utc the signal is 10 dB weaker. From18 utc to 1 utc on the next day, the process is reversed. At 1 utc the signal has the same signal strength as at 12 utc of the previous day. in the ionosphere, the propagation is immediately at it's best. From that moment, the signal will be weaker, until the process is reversed. 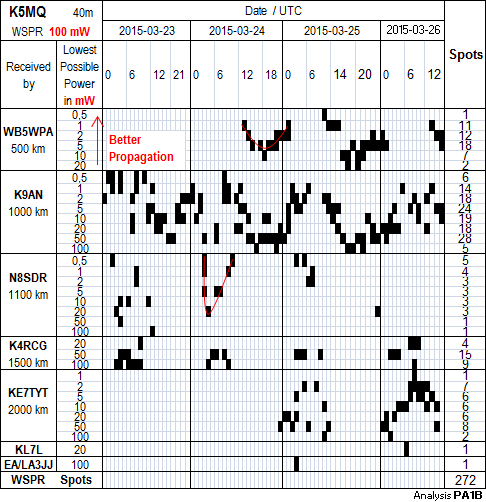 On the 24th we see the same pattern in the propagation, but this time throughout the night, between 3 utc and 10 utc. At 3 utc the signal suddenly appears and is immediately very strong . Than rapidly becomes weaker (16 dB) and than gradually becomes stronger again, to reach the highest value at 10 utc. 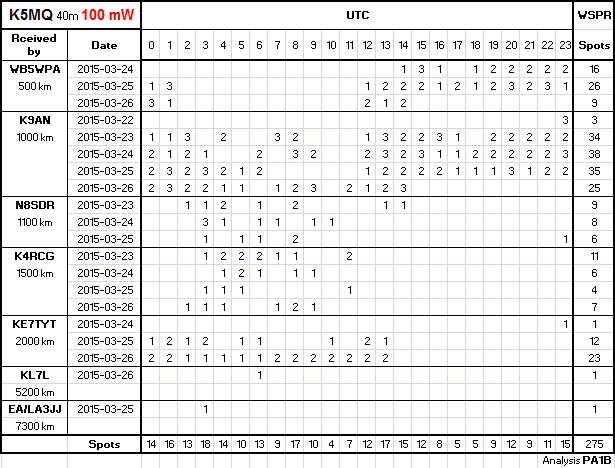 Dave noticed that K9AN at a distance of 1003 km copied his 100 mW throughout the daylight hours, many times. And that he must have a great receiver there. 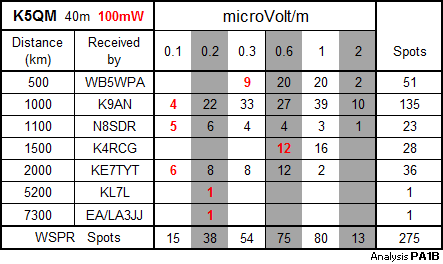 To compare the signals of the different stations I made an analysis of the received signals by the Electrical field strength in micro Volt per meter. The analysis below shows that K9AN, N8SDR and KE7TYT received Dave's signal with the same field strength. hi. The difference between each of the columns is 5 dB. could be received with a SNR of -29 dB. Dave K5MQ reports on his blog, that he has been running WSPR for 4 days at 100 mW output on 40 meters. He wanted to try lower power on 40 meters, than he did on 160 m.
The analysis shows the stations, that spotted Dave for 3 days or more. Under UTC you find the number of spots from hour to hour. Futher, I also chose to show two stations with the largest distance. KL7L from Alaska and EA/LA3JJ from Spain. informative e-mail from that I received from Peter. Glad to hear from you and thank you very much for posting my latest milliwatt results on your blog and the kind comment - I like especially the stamp-sized logos for each entry – nice work. e.g. EA8 or 5B4, but within three years, I could not make a single contact beyond the usual one-hop distance. once you got it, it’s all so easy...with now 5 mW on 15m band some real DX leaped into view. was good for another one into NJ with John/W2ID at 6050 km. I didn’t dare to tell him the truth, because of the heavy QSB. These two OMs must have excellent ears and actually they did most of the work. but of course it’s up to you, whether or not you want to post that, which will require to edit the text a bit. is still under construction and I want to maintain its multiband capability, so far I’ve tested 17m and 15m, but 12m should work as well, but that requires careful planning. Again, many thanks, Bert – keep your great blog going. when I use a calculator without a key for Pi. I have been looking for a fraction with one or two prime numbers. I came up with 113 as divisor, which is a prime number. The numbers are easy to remember. The accuracy is better than one millionth. 10-6. "All Diode" transceiver, the Paraski. For Peter a dream comes true, by crossing the pond with milliwatts. Peter made a few QSO's with 5 mW, into an EFHW vertical on 15 m.
Peters rig has only diodes in the amplifiers and oscillators. It's amazing, even for a milliwatter as myself. WOW. of the Parasaki for 15 meter. for the 20 meter, 2...3 mW, Parasaki, all diode transceiver built in the winter of 2011 by Peter. This weekend I participated in the UBA DX contest. The conditions were not very good , but I still made 27 QSO's with S&P in CW. I could make 1 QSO with less than 100 mW, 3 QSO's with 800 mW. The rest of the QSO's was made with 3 or 4 watts. Rigth at the start, I heard YT1A. Vladans signal was very strong, so I reduced my power. the power to the antenna is reduced to 80 mW. With a distance of more than 900 miles, this results in more than 11000 Miles/Watt. This was the only QSO with less than 100 mW in this contest. After that I made QSO's with 800 mW to 4 watts. The FT-817 here gives less than 5 watt with full power, after a serious mismatch. This is less than 4 watts on 14 MHz or less than 3 watts on 21 and 28 MHz. The ribbon of the Inverted V is not yet repaired. As long as there is no wind, all is OK . See the post on the PACC 2015 Click. But with a wind force of 6 on the scale of Beaufort , it was not always easy. hi.